The European Commission has raided the offices of Intel and other computer makers across Europe as part of a probe into possible anti-trust violations. Intel has been involved in a lengthy investigation by Brussels over alleged unfair trade practices. "The investigations are being carried out within the framework of an ongoing competition case," said European Commission spokesman Jonathan Todd. The US computer chip maker had no immediate comment to make on the raid. In March, the European Commission announced that it was teaming up with Japanese authorities to investigate Intel in the wake of warnings that the US group had been stifling competition in the Japanese chip market. Last month, it emerged that Intel was being sued by US rival Advanced Micro Devices (AMD) for anti-competitive practices. Two suits were filed in Tokyo and are the latest salvos in a two-decade battle between the two companies. Japan's Fair Trade Commission found that Intel violated competition rules by offering rebates to five PC makers, including Hitachi and Toshiba, on the condition that they agreed not to purchase or limit purchases of chips made by AMD or other rivals. AMD also filed a lawsuit in Delaware, US, alleging that Intel coerced customers away from dealing with AMD, based on evidence obtained from 38 companies, including Dell and Sony. "The European Commission dawn raids show that Intel cannot and should not escape the scrutiny of antitrust officials around the world," said Thomas M McCoy, AMD's executive vice president. "Nor can Intel escape the consequences of its anti-competitive actions, which raise prices, threaten innovation and harm consumers." 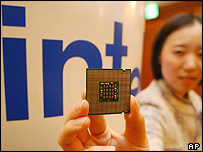 Intel dominates global sales of x86 microprocessors with 80% of sales by volume and 90% by revenue, according to AMD.